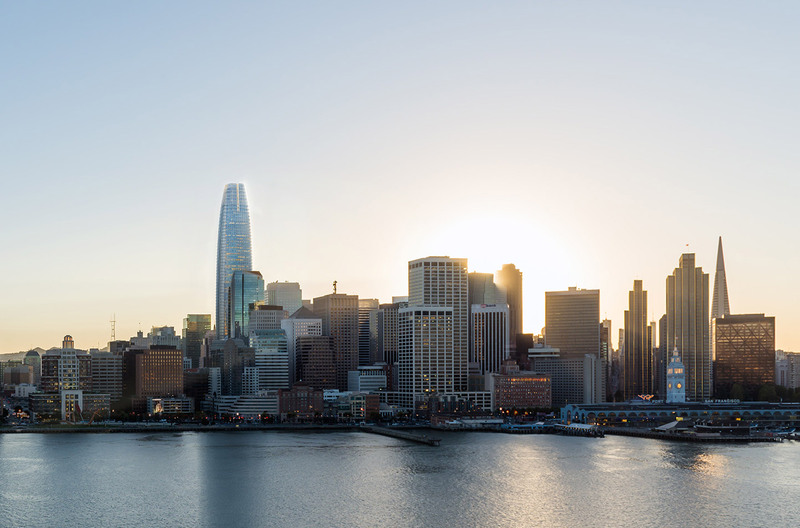 The 1,070-foot-tall, 61-story Pelli Clarke Pelli Architects-designed Salesforce Tower in San Francisco (formerly the Transbay Tower) has officially opened, capping a design process that stretches back to 2007. Much has been made of the tower’s impact on the skyline, as it came to gradually eclipse the 853-foot-tall Transamerica Pyramid as the tallest building in the city, and is now visible from neighboring Oakland. At 1.4 million square feet, the Salesforce Tower has always been divisive, especially among those who feel the headquarters is wholly out of scale for San Francisco, or that the tower represents the tech industry imposing its will on the city. The bullet-shaped office tower, a centerpiece of Salesforce’s campus-like headquarters, opened its doors to employees on January 8th. Clad in glass and horizontal bands of metal accents that serve as solar shades, the building curves at the corners and tapers to a point as it rises. Pelli Clarke Pelli describes the design as aping the “simple, timeless form of the obelisk”. The tower has been LEED-Platinum Certified, and Salesforce claims that they’ve implemented an “innovative water recycling system” throughout. The façade continues past the top floor to create an ethereal crown, using perforated aluminum panels, that somewhat lessens the topper’s impact. A nine-story vertical facet has been slotted inside of the building’s topper, and the empty space within will be used to potentially project lights, patterns and photos across the tower’s crown; artist Jim Campbell has proposed using LED lights to display ever-changing pieces of art. Connected at the base of the tower is the Salesforce Transit Center, a new transit hub that will hold 11 transit systems when it’s complete later this year, also designed by Pelli Clarke Pelli. The Transit Center takes a markedly different approach from its neighbor, making use of a billowing wall of perforated aluminum panels to gently wrap the station’s upper floors. Supported by V-shaped columns, the station is centered around a massive “Light Column,” a sculptural skylight that grows all the way from the train platforms below to the transit center’s roof. The Light Column also serves to open up the main hall of the hub by creating a 118-foot-tall roof. A 5.4-acre rooftop park will top off the transit center, complete with running tracks, cafes, a 1,000-seat amphitheater, children’s playground, and fully accessible grasslands. Pelli Clarke Pelli claims that the ecology of the park will mirror the surrounding Bay Area, and feature everything from oak trees to a wetland marsh. 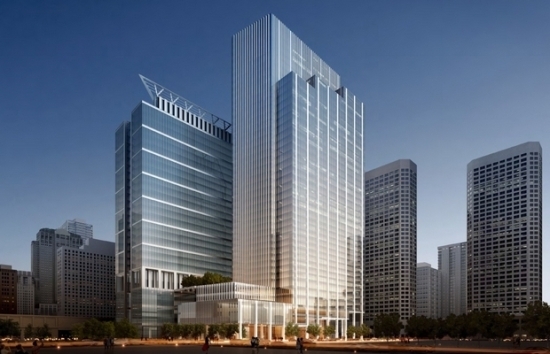 AN will have an in-depth review of Salesforce Tower in the coming months, but in the meantime, Salesforce has posted a preview of the building’s interiors here.